At least three rockets landed in the southern town of Sderot at around midnight Thursday, one of them hitting a synagogue just minutes after the end of a celebration. A number of people suffered from shock and the building was damaged. The incident took place shortly after Prime Minister Ehud Olmert visited Sderot and heard the Color Red alert system being activated. He was rushed by his bodyguards to one of the houses in the city and later visited the home of Defense Minister Amir Peretz. 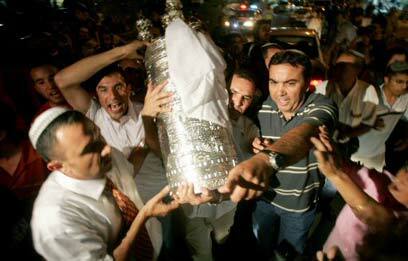 Moti Shitrit, an eyewitness who lives near the synagogue, told Ynet that about 300 people had gathered there in order to bring a Torah scroll into the local synagogue. Luckily, the event ended minutes before the rocket landed there and most worshippers left the place. A few people remained behind to tidy up the synagogue. "We were saved by luck. If people had not gone home, many would have been killed here. God rescued us," he said. During Olmert and Peretz's visit, a Qassam barrage landed in the area. More than 20 rockets landed in the western Negev since Thursday morning. The defense minister invited the prime minister for coffee at his house, where Olmert met Peretz's wife and two of his children. The prime minister and defense minister visited one of the houses hit on Thursday. The two also met with Sderot Mayor Eli Moyal, who accompanied them during the visit. Knesset Member Otniel Schneller (Kadima) also took part in the visit. Olmert spoke to Avi Farhan, a resident of Sderot who had been evacuated from Sinai and moved to the city. When the surprised prime minister noticed Farhan, he asked him what he was doing there. Farhan responded, "I live here in Sderot. I moved here after we were uprooted from (the Gaza settlement of) Elei Sinai." Farhan described to Olmert how the residents were dealing with the Qassam attacks. "We are experiencing non-stop shooting and the IDF must act and respond. The residents here must be assisted not only in dealing with the shooting but also by rehabilitating them, both physically and emotionally." Following this conversation, Olmert asked the director-general of his office to schedule a personal meeting for himself and Farhan at his office. Arieh Cohen, a Sderot resident, arrived at Peretz's home. After he was denied entrance by Olmert's bodyguards, he shouted, "The prime minister is a coward. You came like a thief in the night with all your bodyguards. "What I'm doing is not provocation. I want to talk to you. Only yesterday night missiles flew over my head. I want to hear the prime minister giving me answers. We keep on hearing you and you don’t let us voice our opinions. Entering Peretz's house. Peretz's is a bigger coward than you are, living in a fortified house while we don’t even have shelters." In spite of the rocket barrages, most Sderot residents remained in the city. According to unofficial estimates, between 2,500 to 3,000 people (out of 23,000 residents) have left the southern town so far. Most of those who left were aided by billionaire Arcadi Gaydamak, about 800 were helped by the Defense Ministry and the Sderot Municipality, and the rest left on their own. See all talkbacks "Qassam hits Sderot synagogue after Olmert visit "